25 years ago, a mine blowout on Muddy Creek devastated the life fighting to live in the Cheat River main steam, overwhelming the river with the polluted water known as acid-mine-drainage. For the first time in a quarter century, the pH of Muddy Creek is neutral. Next year, the ICF World Cup, which hasn’t been held in the U.S. since 2003, will host their four-race World Cup Series on the Cheat River. Over the past quarter century, FOC has been instrumental in the restoration of water quality to the Cheat River main stem, resulting in healthy fish populations from headwaters to Cheat Lake. Downstream of Muddy Creek, the Cheat River Canyon is now public land and the Allegheny Trail has been re-opened. Cheat Fest is the same age as Friends of the Cheat. It was born as part celebration and part fundraiser to empower the community to take action to restore and protect the Cheat. Today, it is still the primary annual fundraiser that supports the work of FOC – to restore, preserve and promote the watershed home to many of us. We are still looking for support for this year’s Down River Race and Festival. Help comes in many forms – from attending, to volunteering during the festival, to donating financial support to help cover our costs. Learn more about becoming a sponsor below, or check out our website for other opportunities to become more engaged! We are so grateful for the hundreds of folks who come together to make it all happen! 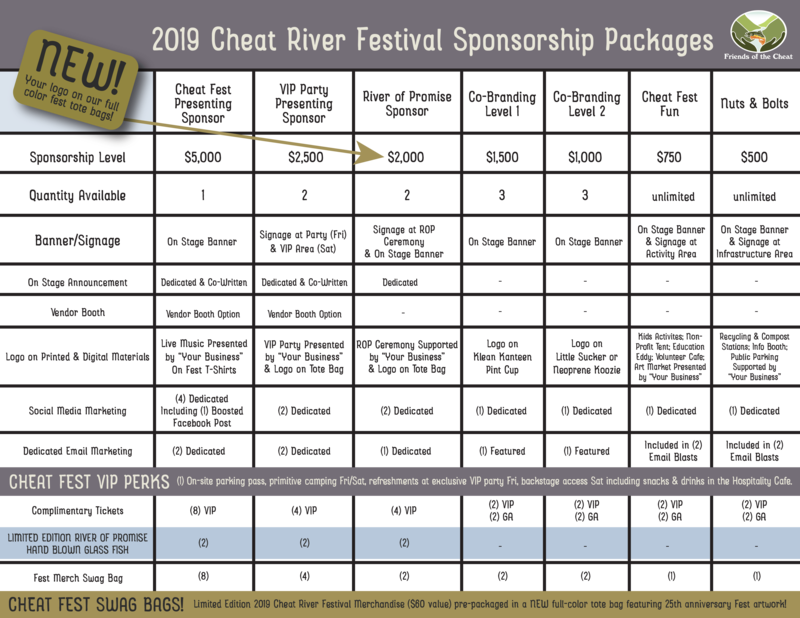 Get in touch with us at Cheatfest@cheat.org if you are interested in joining us as a Sponsor!